The average salary for an accountant in the United States is around $49,350 per year. This is 25% below the national average. ● Updated in 2017. Accountants earn an average yearly salary of $49,350. Wages typically start from $43,912 and go up to $68,277. How much does an accountant make in the United States? A certified public accountant career is one of the most well paid in the United States. In 2015 the CPA profession is also predicted to continue to grow and is a great opportunity for someone entering the job market. Students who earn their CPA license can expect a median salary of $73,800, with top salaries around $124,000. Starting salaries will vary based on an individuals education and experience. 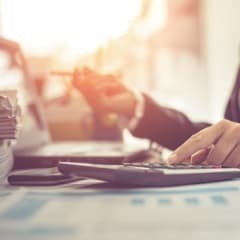 Entry-level accountants at large accounting firms earn between $50,000 and $55,000, while those at mid-sized firms earn between $47,000 and $51,000. The smallest firms generally offered salaries of less than $40,000. An accountant who starts out at $50,000 a year will earn, on average, $52,000 with one year of experience and $65,000 after three years. Accountants at large firms who move into supervisory and management positions earn $80,000 or more, with some salaries exceeding $100,000. Accountant salaries vary across the country. BLS reports that the New York City area offered accountants the highest salaries, and Washington D.C., Boston, and Philadelphia also had above-average salaries. At the other end of the scale, the average mean wage for accountants in Tallahassee, Florida, was $51,850 and in Jefferson City, Missouri, was $49,200. Accountant salaries can vary depending on which sector the accountant works for. Accountants in the financial and technical sectors are paid the highest salaries: $76,310 for investment funds and $74,860 for technical consulting services. Accountants working for state and local governments have average salaries of less than $60,000. How do accountant salaries compare to similar careers? Accountants earn about the same as related careers in the United States. On average, they make less than operations research analysts but more than loan officers.